Author of three other Bhavan's books Sri Krishna. 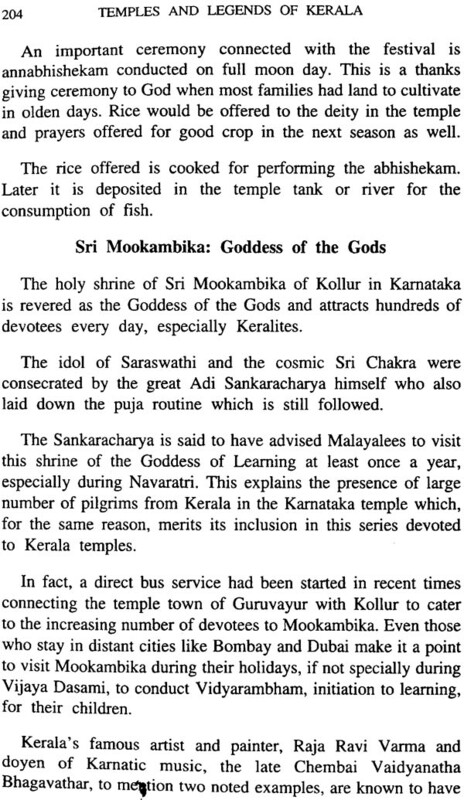 "The Lord of Guruvayur" "Divine Experiences" and "Pilgrimage to Sabari", K.R. Vaidyanathan retired from the Indian Railways after four decades of services. Since then he has been writings for various newspapers and journals and has also authored a book in railways humour and 150years of Indian Railways. 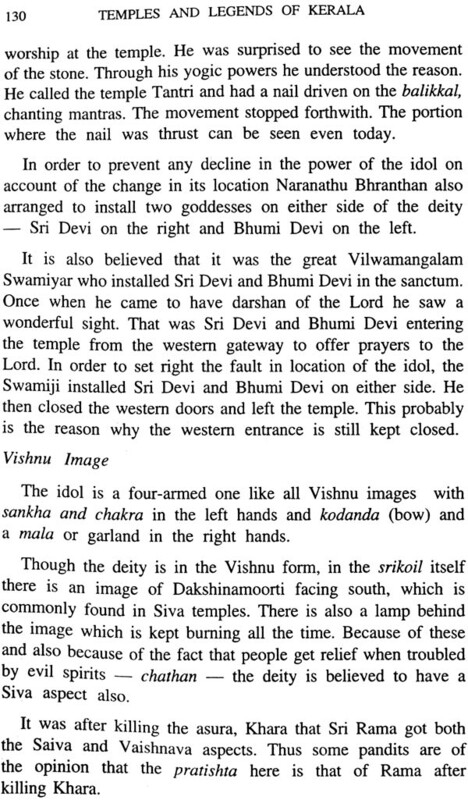 As the author of books on two of the most prominent temples of Kerala-Sri Krishna, The lord of Guruvayur and Pilgrimage to Sabari which were fortunately well received by the public, the Bharatiya Vidya Bhavan thought I would be the natural choice for the series on temples which they are bringing out for different States. While I am grateful to the Bhavan for entrusting me with this noble task, I however found that the work involved was stupendous. There are nearly 1,300 temples under the management of the Travancore Devaswom Board alone which controls temples in the erstwhile Travancore State. 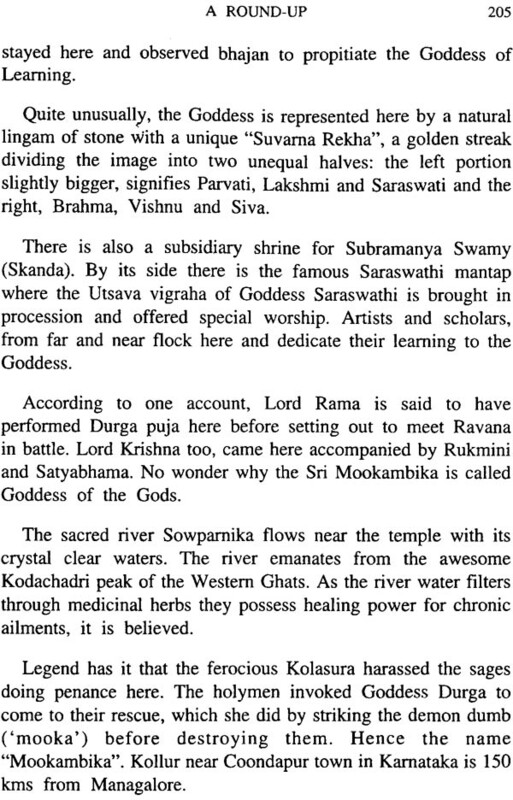 Similarly the Cochin Devaswom Board has nearly 400 temples in its jurisdiction in the former Cochin State. 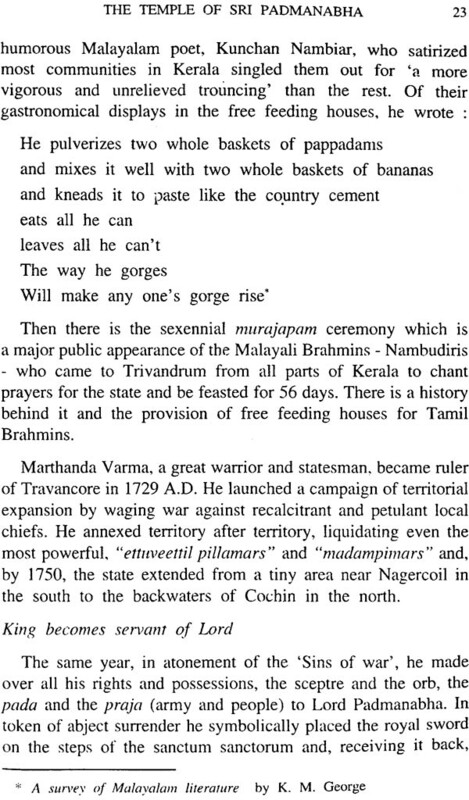 Then comes Malabar which too has hundreds of temples. It would be humanly impossible even if one devoted one's entire lifetime to cover all these numerous temples each claiming some importance or order. It will not be possible to do justice even to all the major temples. The author was therefore, compelled to confine his narratives to a few of the better known temples the selection being of course very difficult. 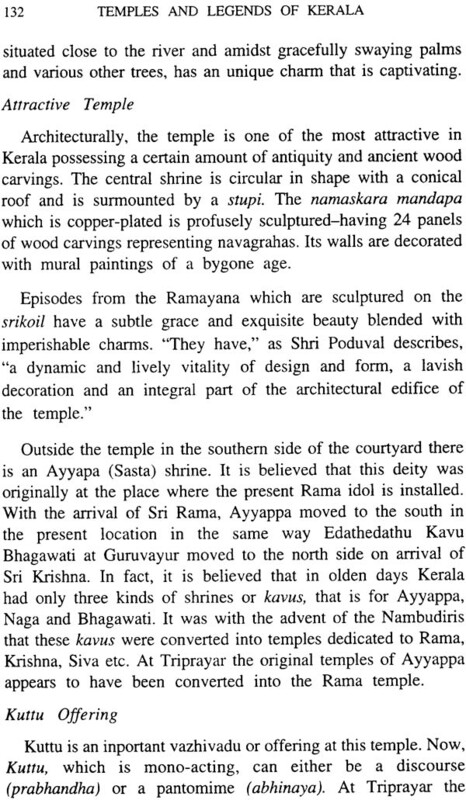 Even if those included in this work created an awareness among the devout of rich heritage of temples that belongs to Kerala I would feel my labours amply rewarded. The following books provided me with good reference material: Mahashetrangalku Mumpil and Kshetraprada-kshinam by Nalamkel Krishna Pillai and published by Sahitya Pravarthaka Co-operative Society, Kottayam; Eithihyamala by Kottarathil Sankunni Published by Kottarathil Sankunni Memorial Committee, Kottayam; A Survey of Kerala History by A. Sreedhara Menon (Sahitya Pravarthaka Co-operative Society); A Short History of Kerala by Prof. K.V. Krishna Ayyar. 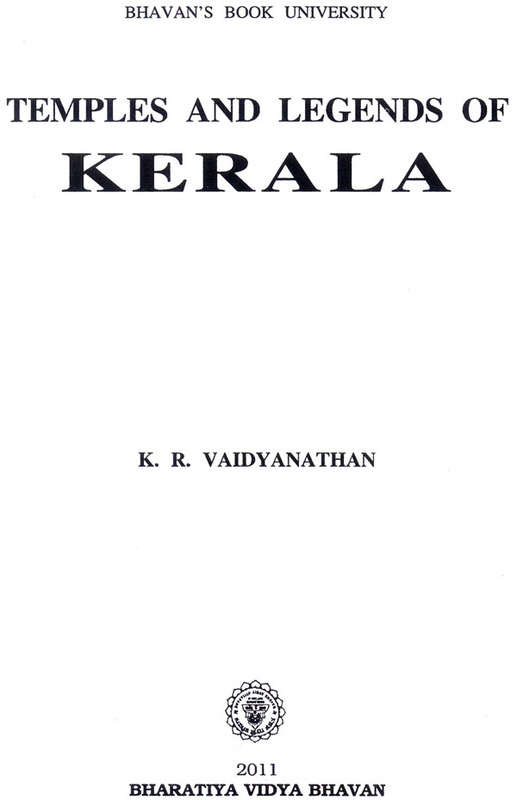 The Arts and Crafts of Kerala, both published by Paico Publishers House, Cochin; Monuments of Kerala by H. Sarkar, Archaeological Survey of India; and Splendours of Kerala a Marg publication. I am indebted to the authors/publishers of these works. I am also extremely grateful to R.G.K. formerly of the Illustrated Weekly of India, for going through the manuscript critically and offering valuable suggestions. Lastly, I offer my respectful obeisance to his Holiness Jagadguru Sankaracharya of Sringeri Sarada Peetham who has graciously blessed my humble work by granting Srimukhom. 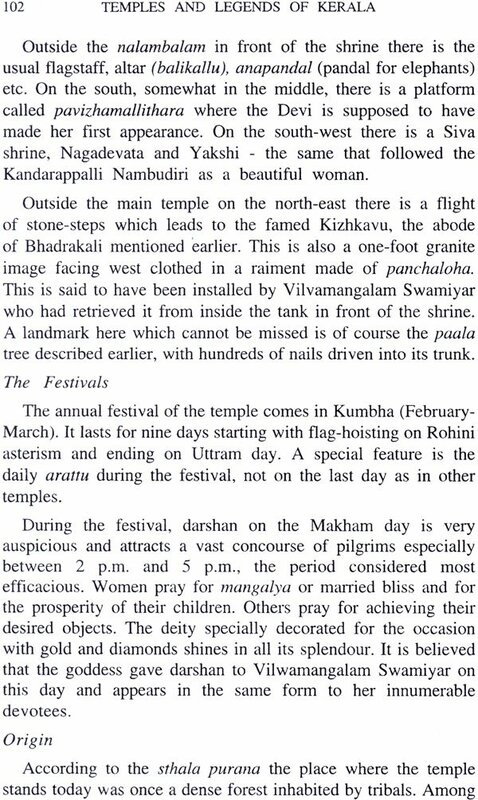 Of Kerala temples, Stella Kramrisch once wrote: "In this beauteous, bountiful country between sea and mountains, green in the density of high tress land the temples-2200 are in worship -are part of the scene". 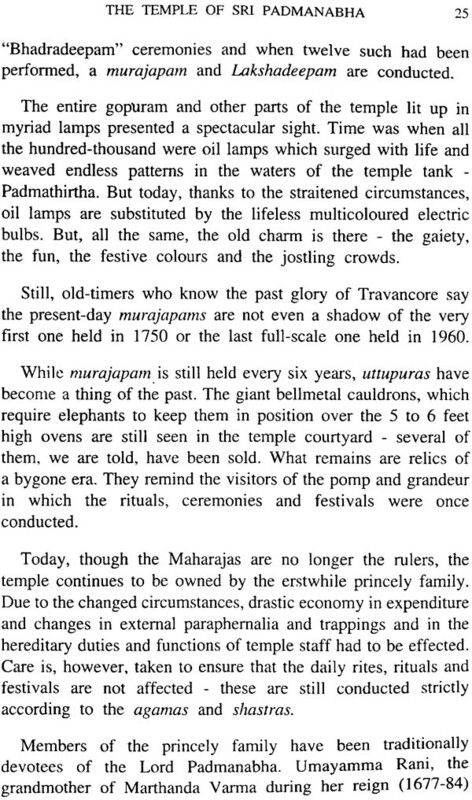 To an average Malayali, the day begins with a both in the temples tank. 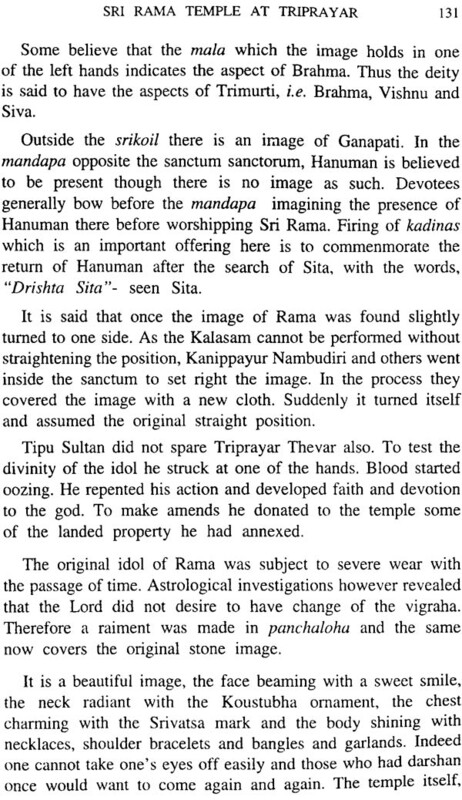 He makes ha dash to the temples with the mundu still wet and circumanbulates the deity, chanting the Lord's name. With his forehead chest and arms smeared with ashes and sandal paste he emerges into the workday world with the felling that day has begun well for him. Indeed despite the influence of Marxism and the philosophy of materialism, the gods and goddesses in Kerala seem more real than elsewhere. 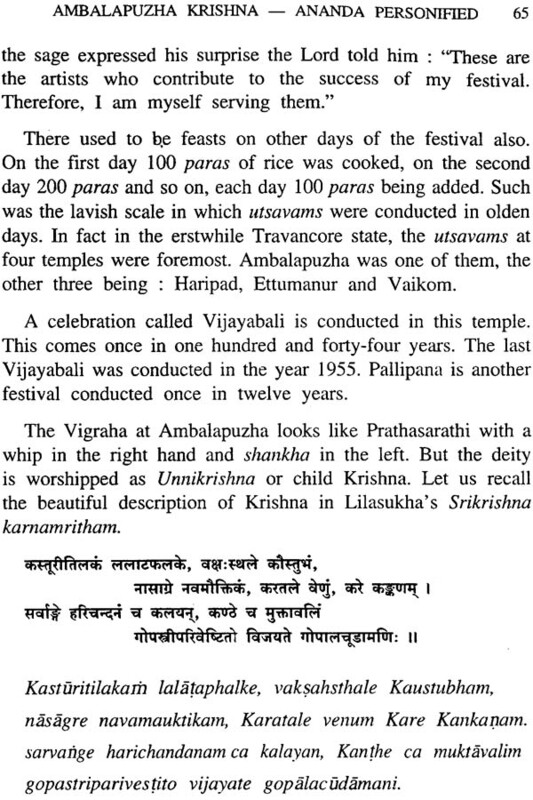 Malayali life is intimately associated with temples. 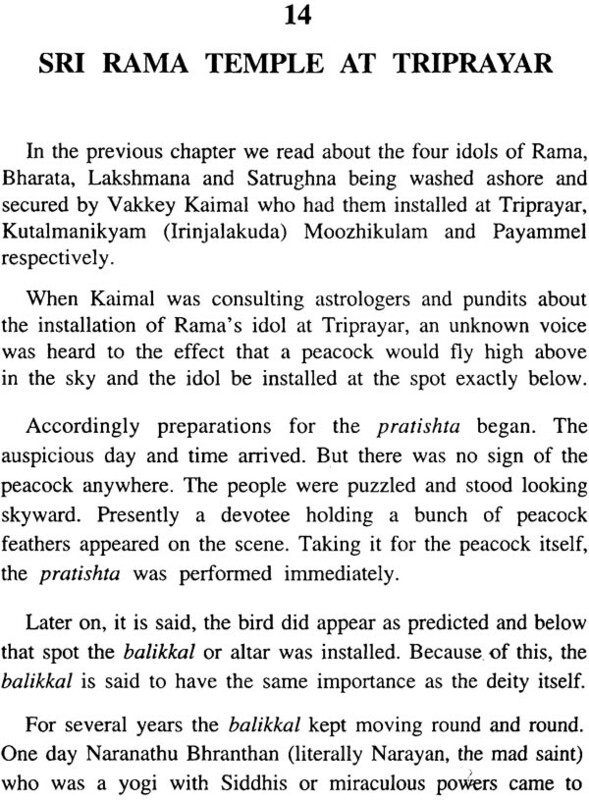 All the time they invoke the names of popular deities like Guruayurappan or Ayyappa. In times of trouble - which is unfortunately very often - they turn to their deities for relief and succour. The gods are even called to witness events like marriage, annaprasanam (feeding ceremony of the child) or any other important occurrence in the family. Malayalis even take their gods wherever they go and settle. Thus you have Guruvayurappan or Ayyappa temples practically in all major cities in India and even abroad. 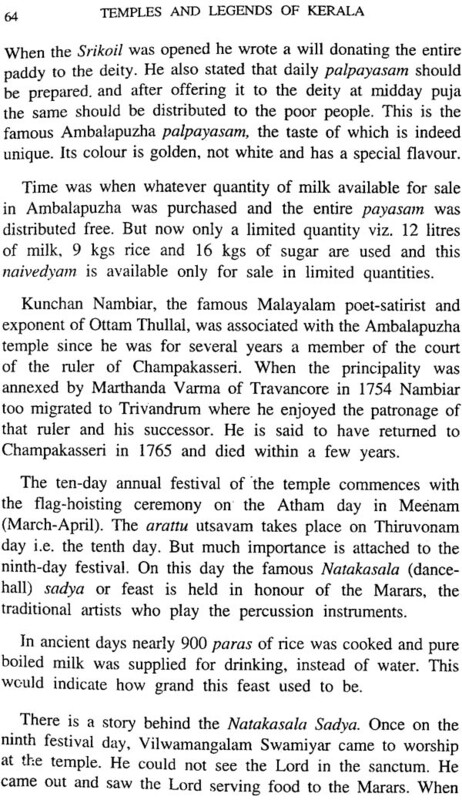 Until a few years ago temples in Kerala even offered food to the devotees especially to those belongings to the upper castes. A major event in the temple is the annual festival which provides a special occasion for workship and opportunities for social rejoicing. Thousands turn up to watch elephants with colourful parasols and flying whisks held aloft them and to hear the plying of drums music or participate in general merriment like fireworks, exhibitions etc. Vendors and hawkers too gather and do brisk business. 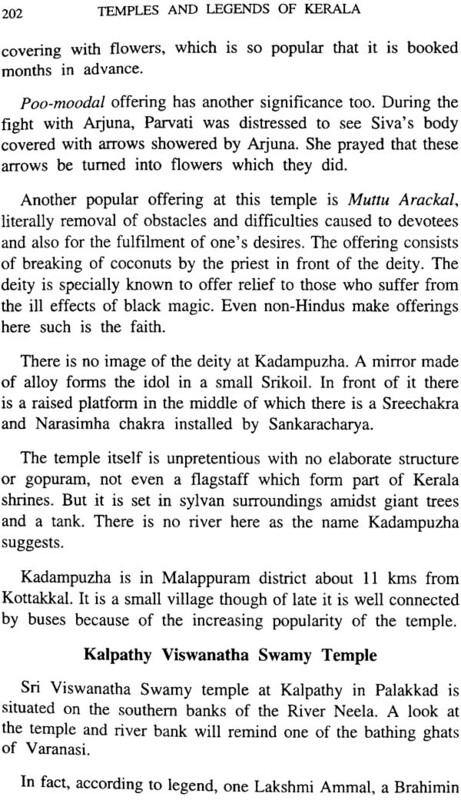 Thus, "a temple in Kerala", as K.P.S. Menon put it, is at once a house of prayer a social club and a cultural centre." It plays a role in the lives of people far more vital than any other institution. 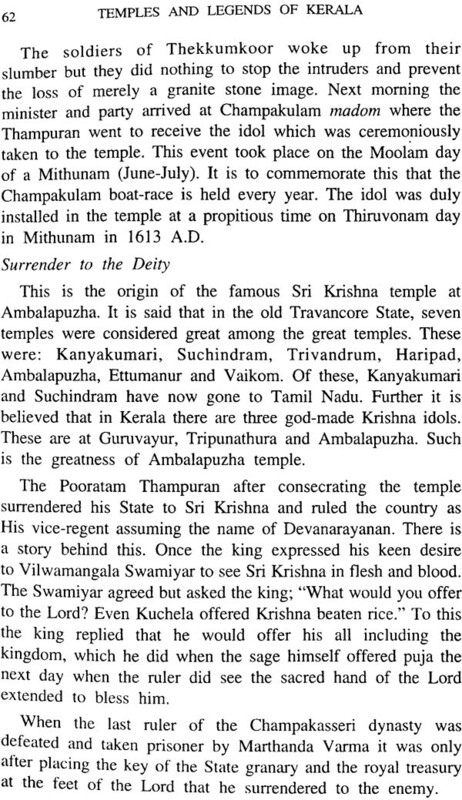 How did Kerala become a land of temples and temple workship become so popular as to acquire a place of importance in religious and cultural lives of people? 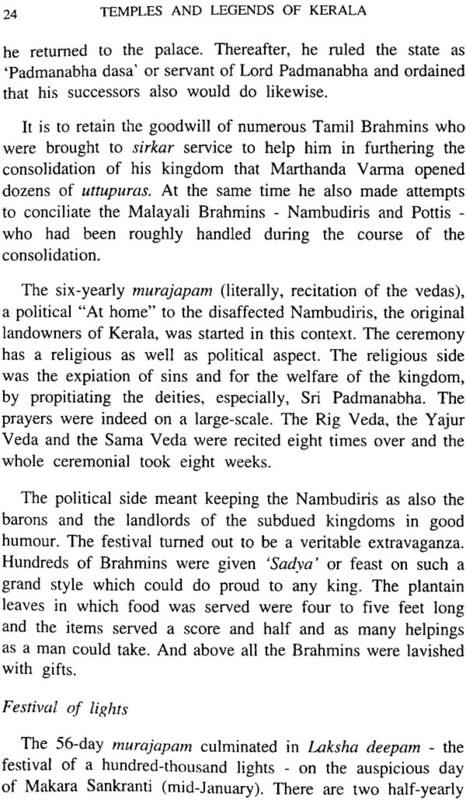 It was mainly due to the Aryanisation of Kerala which reached its climax in the 8th century A.D. with a major Brahmin influx from the North which led to the foundation of a many Hindu temples with a view to popularising Hinduism saints which created a mental and religious stir among people culminating in Sankaracharya's Advaita, in the 9th century. 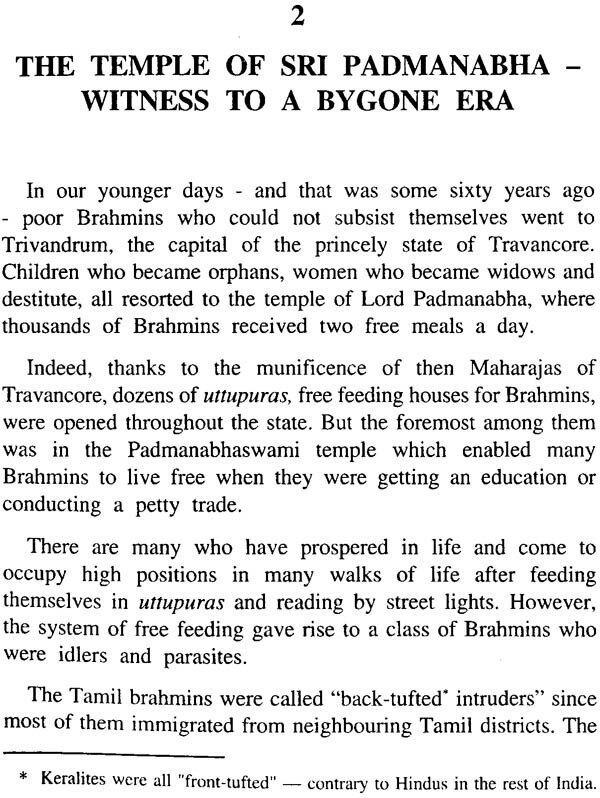 Long before the advent of Aryans people of ancient Kerala followed Dravidian practices which were not based on any particular religious philosophy. They worshipped totem gods and innumerable spirits inhabiting rivers trees, hills etc. There were local deities guarding the borders of villages and demons that caused diseases. They propitiated them by offering food to the accompaniment of music and dancing. 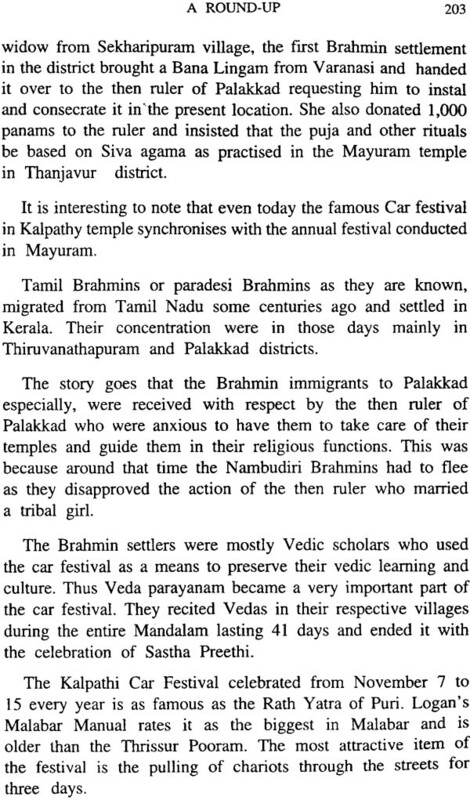 While the people were thus following Dravidian practices of workship religious from the North, viz Jainism, Buddhism and Brahminism entered Kerala in the centuries prior to the beginning of the Christian era. Through these religious gradually got.